Bucks CC Reserves were celebrating once again on Monday evening after they completed an ADL cup double with victory in the final of the Marsworth Reserve Cup. Having lifted the Reserve Cup with a 1-0 win over Long Marston Reserves three weeks ago, this time Bucks notched a 3-2 victory against the same opponents to add another trophy to their ever-growing cabinet. Bucks have also already sealed the runners-up spot and promotion from Division Two, while in contrast, Long Marston have had a week to forget after being pipped to the Division Three title before suffering further disappointment in another cup final. 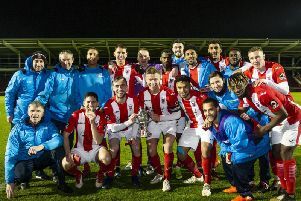 Elsewhere, another team who have been celebrating are FC Mandeville, who put last season’s disappointment behind them to clinch the Sheffield Jackman Cup at Tring Athletic last week. After being well beaten in the 2014 cup final, Mandeville this time came up against Longwick and again fell behind when Tom Keen netted, but Harrison Mann quickly equalised. The match remained all square after an evenly-balanced second half before Stuart Creaser’s 115th minute goal sealed the win for Mandeville. Steve Lane won the Man of the Match award. Mandeville also have the Berks & Bucks Junior County Cup final to look forward to in Newbury this Saturday. The line-ups for several other Aylesbury & District Football League cup finals have also been confirmed. Saturday saw the semi-finals of the Tom Sparkes League Cup take place at Fairford Leys, where Bucks CC Reserves’ hopes of a treble came to an end after Aylesbury Park Rangers bagged a last-minute winner to sneak into the final. Lemar Mason-Williams and Aaron Bonham were both on the score sheet in a 2-1 win. In the final, APR will face cup specialists Bucks CC’s first team, who beat Haddenham Utd 2-0 thanks to late goals from Ray Long and Ray Undi. The final takes place on Wednesday, April 29, at Tring Athletic, 48 hours after Bucks host Wendover in the Marsworth Senior Cup final. In the Subsidiary Cup, this weekend’s Senior Cup final at Fairford Leys will be contested between Aylesbury Dynamos and Elmhurst. The Dynamos cruised through with a 7-2 win over Marston while Elmhurst beat Pond Park Rangers 2-0. In the junior version, Great Milton booked their place in the final with a 5-2 victory over FC Mandeville Reserves, with Long Crendon Reserves also making it through as they beat Tetsworth Reserves 4-2. In league action, with the Premier Division complete, the focus was on the ongoing battle for the Division One title, and Wendover kept themselves in pole position thanks to a 2-0 win over Longwick Sports. Darren Woolard and Alex Grover both netting. FC Mandeville ended any fears of relegation by beating Bedgrove Dynamos 4-2, with Steve Keating scoring a brace and Billie Harrison and Harry Bowe netting the others. The chase for the Division Three title is over after Wendover Reserves held Long Marston Reserves to a 3-3 draw, which meant leaders Tring Town AFC can no longer be caught and are therefore champions.